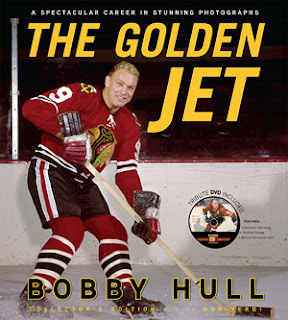 You already know Bobby Hull had a spectacular career. Let me assure you the photographs in this books truly are stunning. Consider this book is a coffee table autobiography. Countless photographs accompanied with Bobby's own captions brilliantly bring back to life the amazing career of one of hockey's true greats. The photos steal the show, but Bobby's commentary are the true jewels of this treasure chest. The book is also accompanied with a tribute DVD featuring exclusive interviews, archival footage and behind the scenes clips. This book is listed at $29.95 US/$34.95 CDN. (Apparently no one has told Triumph Books that the Canadian dollar is at/over par for a few years now.) For a book of this size loaded with so many rare and exclusive photos, that is a really reasonable price. And of course, many bookstores and online sources are selling it 30% less than the jacket price. I wish other hockey greats would consider such a project as this. I hope Triumph Books is looking to create a NHL series of books along these lines, as I am a big fan of their approach. By The Way: Of course, more recent fans know Bobby Hull strictly as Brett Hull's dad. This is a great chance to learn more about one of hockey's true legends. Oh, and Brett makes more than a few appearances in the book - from a tot to a pee-wee to a NHL star in his own right.